So, believe in whom you trust and trust what you know. Mother cradles son with broken femurs. Two years ago we sent teams to the most remote villages to record people’s opinions about the coming national park. They brought back harrowing tales, along with filled out questionnaires. How is a medical emergency handled without doctors, medicines, first aid equipment or even roads? Herbs were administered; the thighs were scarified. 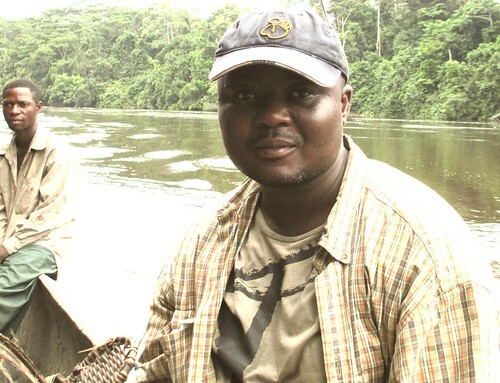 Ferdinand brought this story: The school director of a small village in Kasai sent all the boys between ages 9 and 14 to cut forest for his rice field. They chopped down big trees, trees their parents would never let them take down without supervision. A tree fell on a young boy’s legs. Both femurs were broken. Ferdinand found the boy in his mother’s arms and the traditional healer at work. What was the result? We have not been back. 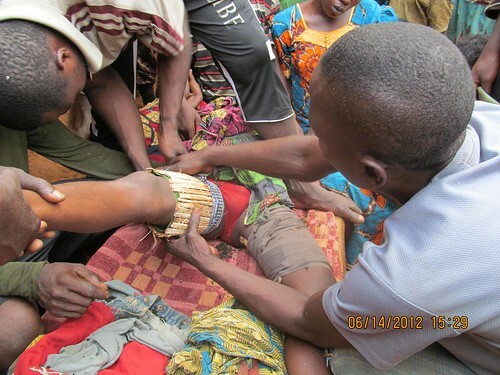 The traditional healer immobilised each leg with a locally made cast. Unfortunately, now we have had a chance to see up close the limits of traditional healers…and specifically for broken femurs. 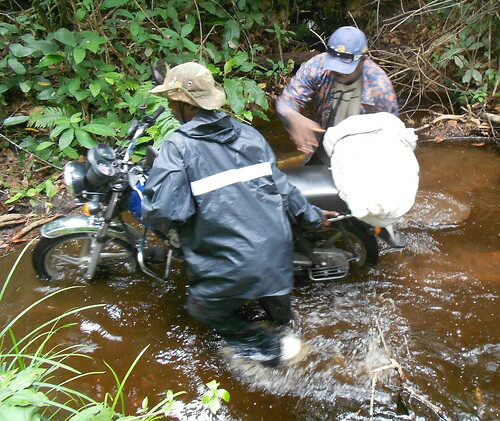 Guylain and Salumu, together, guiding a motorbike over a narrow submerged bridge. For years we avoided bone-breaking accidents, then this December it happened. All our motorized transport is by motorcycle. Guylain, our most careful and expert driver, was taking Jeanne, a team leader, north to Bafundo. Guylain is not only motorbike chauffeur, but also our electrician and mechanic. 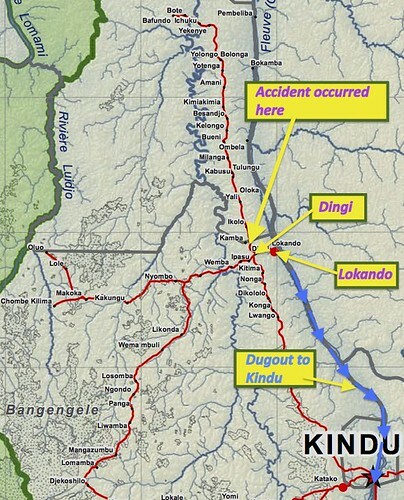 Five kilometers north of Dingi a second motorcycle came at top speed around a corner on the wrong side of the road. It swerved too late. The second motorbike was carrying four people. The site of the accident. A larger geographic view and scale bar visible in maps tab. Jeanne estimates that it was at least a half hour, perhaps 45 minutes before another motorbike, belonging to a Mr. Abu, came and found them. Guylain was unconscious but alive and seemed the most seriously hurt. Mr Abu took him to Dingi where he was revived, then came to get the others who had fractures: Jeanne, the other driver and a passenger from the other bike. One by one he took them first to Dingi, then on to the military hospital in Lokando. Jeanne with other team leaders and John at camp Katopa. This was the 13th of December. I had just returned to the United States, John was on the Lomami heading north. Salumu in one of our dugouts on the Lomami. 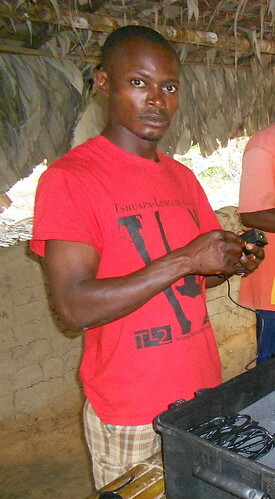 Leon Salumu, our point person in Kindu, received a phone call from Mr. Abu’s chauffeur the next morning. 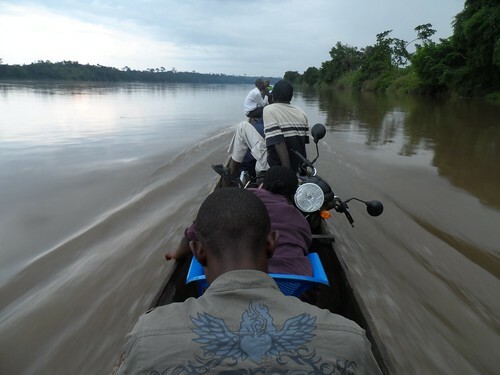 In less than an hour Salumu organized our Kindu dugout, borrowed an outboard motor, found a helmsman, and convinced a doctor to accompany him. They were on their way to Lokando. Jeanne positioned in dugout to head back upstream to Kindu. Guylain could not talk, obviously he had severe head pain and there was nothing they could do at Lokando. Jeanne had a snapped femur, but there was no x-ray at Lokando. 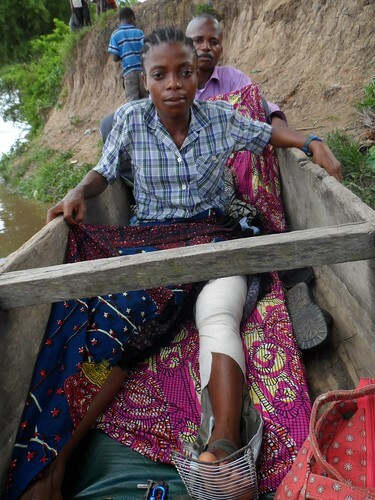 The doctor immobilized the leg and that evening they were on their way back to Kindu. Patients from the other motorbike stayed close to their family in Lokando. Trust what you know. Guylain, foreground, slumped in the dugout as it starts back toward Kindu. There was a hard rain and no tarp over the dugout. They arrived in Kindu, drenched, as night fell. Leon and Doctor John arranged to get Jeanne to the new hospital, Matata Mpoyo, where it was assumed they would have the most complete equipment; Guylain was taken to the general hospital where it was assumed there would be the most qualified neurological experts. The next day it was clear: no possibility to put Jeanne in traction in Kindu, but that was what was needed. No possibility to make a neurological scan for Guylain in Kindu, but no other way to know the severity of the injury. They had to come to Kinshasa. They had to be accompanied by a doctor. 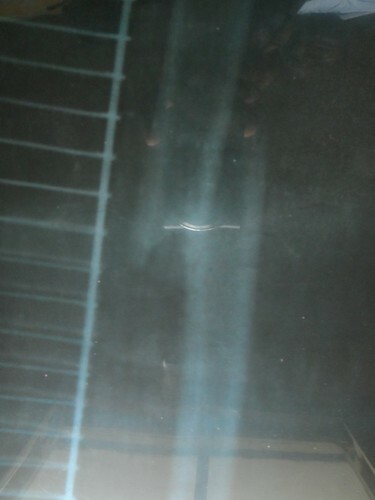 X-ray of Jeanne’s snapped femur. The next plane was in three days. Salumu went to buy tickets, all sold out. It was a matter of doubling what he would pay and seeing who would sell. Leon managed to get tickets, two for Jeanne so she could keep the leg outstretched. He organized transport to get them to the airport. Guylain and the doctor arrived. At the last minute Jeanne and her family said “no”. They would use a traditional healer. Trust what you know. 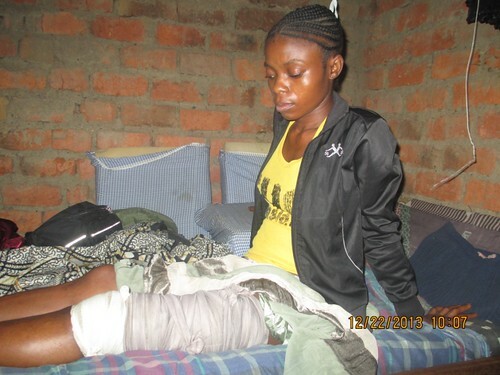 Jeanne’s receiving traditional care for her broken femur. 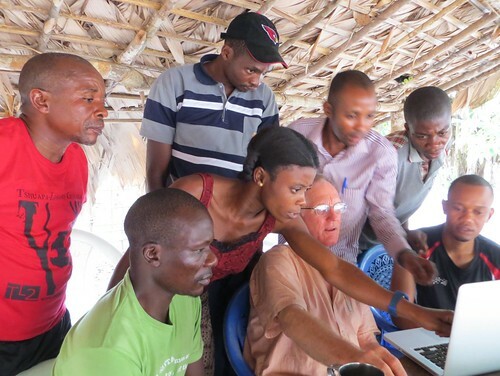 More than a month later, on January 22nd Guylain returned to Kindu. No further malaise from the concussion and the cast is off his foot that also had a broken phalange. 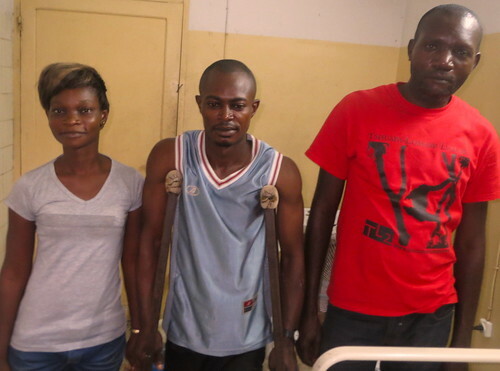 Guylain at the General Hospital in Kinshasa with the TL2 project’s secretary, Bibyche, and our Kin chauffeur, Lu. 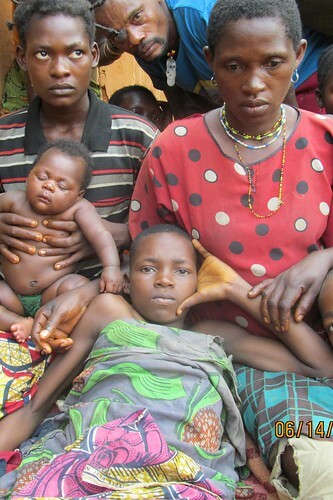 Jeanne went through two traditional healers and the family has now found a third for her. Between the second and the third Jeanne had another x-ray. The femur is not in the correct position. It is “cemented” in the wrong position. 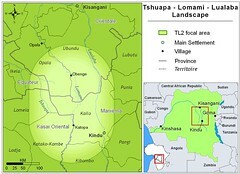 Even now we are trying to convince Jeanne and her family to let her come to Kinshasa, but it is with diminishing hope. Trust what you know. Concerning the four people on the other motorcycle, the driver has three fractures and is being treated by a traditional doctor in Lokando. The older woman who was being taken to Lokando because of deteriorating health with diabetes and tuberculosis died of her injuries two days later in the Lokando hospital. Her daughter and grandchild are fine. This entry was written by Terese Hart, posted on 2014-02-03 at 10:56 am, filed under About the project, Indigenous peoples. Bookmark the permalink. Follow any comments here with the RSS feed for this post. Post a comment or leave a trackback: Trackback URL. Salumu told me about the accident. Very happy to hear that Guylain is well recovered and I hope very much that Jeanne and her family can be convinced to let her receive medical treatment soon. Best wishes to all of you. That is very sad to hear that. But I know that the venue of national park in the area will be an end of tunnel for those people. May God bless you for what you are doing for them. Dear Hera, It is sad now, but we still do hope that we can convince Jeanne and her family to seek medical treatment and save her leg. It would be heart breaking otherwise. I will write an update in a couple of weeks or — hopefully — sooner. This has always been my nightmare, another motorbike smacking into us around a corner. I hope you can find a way to convince Jeanne to get her leg properly treated!